All of my photographs are available on ceramic tile. 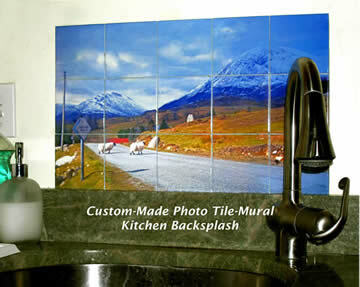 You can also have your own photographs put onto tile. Where do people display tiles? Living rooms, bedrooms, hallways, bathrooms, kitchens, etc. The vibrant, high gloss look of your tiles will give you a chance to make a powerful statement - a beautiful addition to your home. 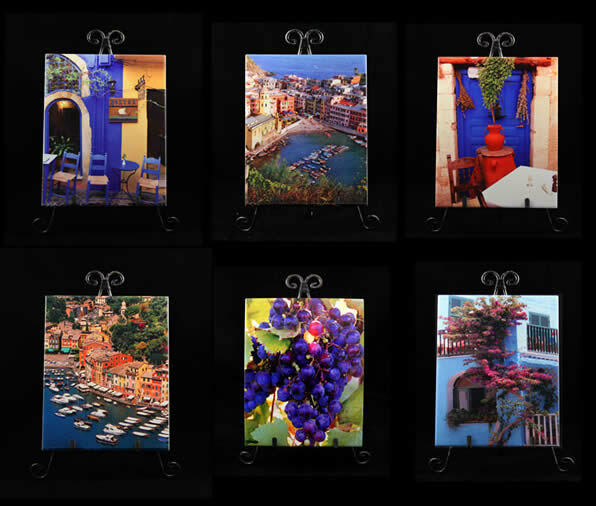 Consider hanging many of them together as a set - a creative alternative to large framed artwork. Display your tiles on easels (easels are also available for sale). Hang them with or without a frame - hooks are glued to the back. Your tiles won't be ruined by moisture, so hang them confidently in kitchens, bathrooms, vacation homes - any place where moisture might be a problem. 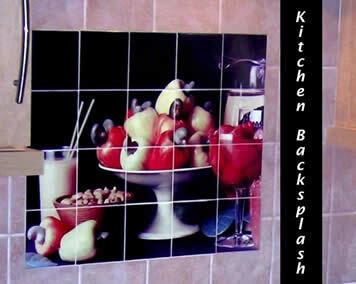 Install your images or mine onto the walls of your kitchen or bath. Order form for David's images onto ceramic tile. 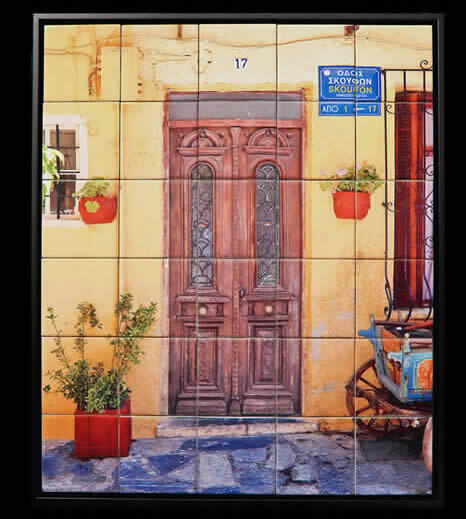 Here's the link for custom-made tiles from your own photos. Why do you print your photos onto ceramic tile? I think my artwork lends itself to the unique quality that the tiles offer. With the tiles I can make my images really “pop” the way I intend them to. The tiles give me a chance to create images with rich, saturated colors - plus the combination of the dyes used to create the image and the tile’s glaze help give the images a more powerful three-dimensional impression that can’t be achieved with photographic prints. My images on tile all have hooks glued onto the backs (you can also place a special order to get my images without hooks if you prefer). The glue used for the hooks is especially strong. It will hold 4000lbs/in of pressure, so you can be sure that the hooks will hold. 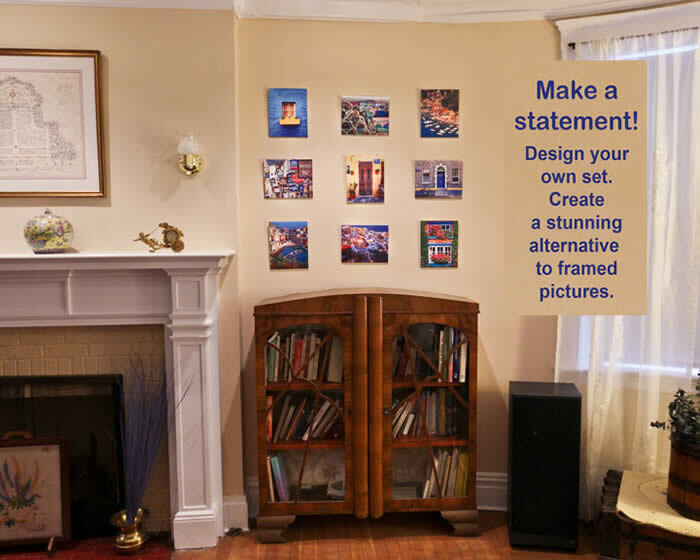 If you are ordering your own custom images on tile, you have a choice of having a hook glued to the back for a small additional fee, or you can get your tiles without hooks. Can you put my own personal photographs on tile?